Welcome to Cascadia Cabs. Our goal is help create a livable, humane streetscape. We dream of Cascadian Cities utilizing our streets as places of interaction and commerce. 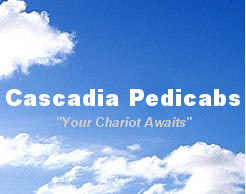 We provide safe, fun, and eco-friendly means of transportation Pedicabs in the Pacific Northwest. Each of our locations utilizes locally trained drivers. We would love use our Pedicabs to help with your wedding, special event, or any other creative idea. Call 360.510.1818 for more information.